Here are a few tips for using the Email Editor in AgencyBloc for both Email Marketing and Automated Workflow. In order to view more or all of your email draft while editing, click the maximize icon. The edit window will expand to a full-screen view, showing only the email draft for edit. To return to the default edit view click, the icon again. 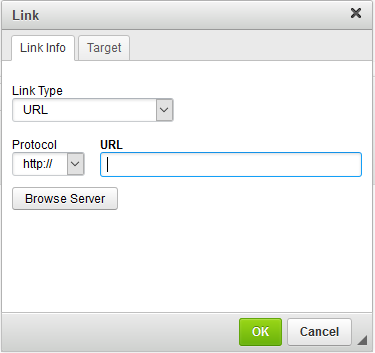 You can add a link to direct a recipient to a website. On the toolbar is a link icon. Clicking on the icon will open a window to add a URL. Then click the link icon button. In the pop-up window, type in or copy and paste the URL to where you want to redirect them from the email. Click OK. The word or phrase will now be an active link in the email. ‘Target’ is an option of how to redirect them from their email browser. The email editor has the option to view the email in HTML format. Clicking the source icon will display the source HTML and allows you to edit/insert HTML. Clicking the icon again will return you to the standard view. The email editor AgencyBloc incorporates a 'hard' return when you hit Enter, meaning it creates a paragraph break - a double-spaced return. For a 'soft' (single-spaced) return, hold down the SHIFT key, then click Enter. Adding files such as PDF’s, documents or spreadsheets is not available when creating emails. This is due to potential file size and/or viewing capability limitations on your recipient's end, as such we do not allow or suggest this option. We suggest using a link (see Adding a URL Link above) - either to a page on your website or by using a web storage service with viewing capabilities - so your recipient can click to the location of the document.